"always looked out for his men"
Sept. 9 was a lot like any other Sunday for Joseph and Robert Gullickson, a pair of brothers who shared a special bond made even closer by geography. The brothers, who lived two doors from one another in West Brighton, met outside that sunny afternoon by happenstance, chatting briefly about their plans for the day. "He was just out walking the dog and, as usual, we were just talking," said Robert. "We had a very, very tight relationship. We were basically best friends." Joseph, a World War II history buff who enjoyed reading biographies of generals who fought in that war, was especially excited about watching "Band of Brothers," which premiered that night on HBO. "Joe was an exceptional officer, always learning, always teaching and, above all, always looking out for his men," said Capt. 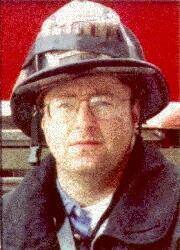 Tom Giordano of Ladder 101. "This was a man dedicated to his job and totally devoted to his family," he added. "My prayers go out to his family, especially his lovely wife, Naoemi, and his children, Amanda and Isabel. I am proud to call Joe a brother, a hero, a friend." "We were a special couple and he absolutely adored his children," said his wife, the former Naoemi Perez. "Joe was a loving and protective family man. He was big in stature and spirit. He had a big laugh and a very gentle disposition." Mr. Gullickson loved taking his daughters -- Amanda, 3, and Isabel, 1 -- on outings to the Staten Island Zoo and Clove Lakes Park, and he was especially proud accompanying Amanda to pre-school. "He was very proud of his daughters, right from the start," his brother said. "He was excited about getting involved in their lives. Even after a long day at work, he would always find time to push Isabel down the street in her stroller while Amanda rode next to him on her scooter or bicycle." "Joe was like sunshine on a cloudy day," said his mother, Patricia. "Most of all, I'll remember how he was always there with that radiant smile and great laugh. I'll miss him dearly." Mr. Gullickson loved dogs, especially Lucy, his Rottweiler, who was bred from a dog owned by his father, Robert. He also was a big fan of the TV classic "The Honeymooners" and enjoyed listening to popular music. The Grateful Dead and Frank Sinatra were among his favorites. "Joe had a great love of American popular standard music," said his longtime firefighter friend, Zeke Quin of West Brighton. "We would sit and listen to everything from Frank Sinatra to Merle Haggard, while trading one-liners from 'The Honeymooners.' I'll miss him." "Joe came to Engine 243 as a probationary firefighter who was eager to learn, respectful and polite," said Vincent Masucci, a retired lieutenant who knew Mr. Gullickson at the beginning of his career. "I took an immediate liking to him. He stood out and was a very likable guy." Mr. Gullickson's brother, Robert, an engineer who works in SoHo and saw the Twin Towers collapse from an office window, made his way to the World Trade Center on the morning of Sept. 11, figuring his brother was at the site. Robert was later joined by his youngest brother, Ralph. The two stayed at the command center until 2 a.m., waiting for word about Joseph. "We truly believed it was a rescue operation at that point," said Robert. A memorial mass is scheduled for Saturday at 10:30 a.m. in Blessed Sacrament Church.